Addressing concerns about her emails publicly for the first time on Tuesday, Clinton told a packed room of reporters at the United Nations that she regrets conducting State Department business from a personal email account, but welcomes the imminent disclosure of the correspondence in question. “When I got to work as secretary of state, I opted for convenience to use my personal email account, which was allowed by the State Department, because I thought it would be easier to carry just one device for my work and for my persona emails,” she said. “Looking back it probably would have been smarter to use two devices,” she added. A scandal has erupted in recent days after it was revealed that Clinton, while serving as secretary of state under Pres. Barack Obama, conducted government business from a personal account that was operated from servers registered to her family home in New York state and first administered on behalf of her husband, former President Bill Clinton. 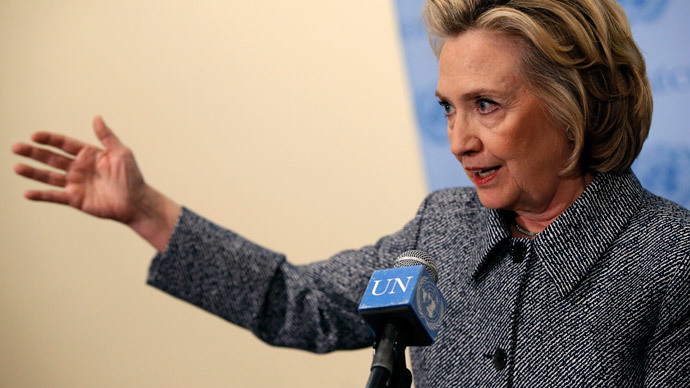 The use of the previously secretive email account has since raised questions from critics of Clinton about any correspondence that may have been destroyed before being provided to the United States government, per the Federal Records Act, as well as security measures that may have protected those messages from hackers, state-sponsored or otherwise. All work-related emails from the account that were not personal in nature have been handed off to the government to be published, Clinton said, but private correspondence – messages about her yoga routine, family vacations and “the other things you typically find in inboxes” – have since been purged. According to Clinton, no classified materials were sent through her personal account. She expects the trove will become publicly accessible in the near future.